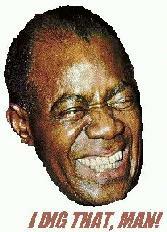 NetControl.net Archive of :: Welcome to the Original and Definitive Louis Armstrong Home Page! (note that this is being rebuilt during my study breaks and that many links don't work right now. sorry, but it's better than nothing. and remember, like neil young said, "we tune because we care") Last updated 5/5/96. Welcome to the New Original and Definitive Louis Armstrong Experience! Sources * Links * New! You are importante muchacho numero . You'll have the most rewarding relationship with this page if you're using the Netscape 2.0 browser. Need more information? Try this or go to the Yahoo search engine.